This panel lets you create incremental named copies for all open files in Flash IDE automatically. The system used prevents undesired overwritten files. 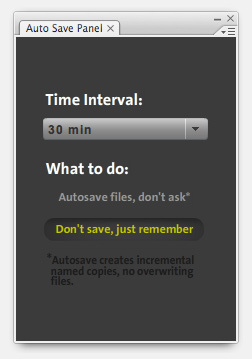 Access panel via Menu > Window > Other panels > Autosave. When panel is closed autosave feature ends, but not when panel is minimized. Unable to save the document as “\\C”. Please try saving to a different filename or to a different location. Ya intente dandole permisos de administrador a Flash CS5 y nada, tendras alguna idea de que esta ocurriendo?